Apartment in Barcelona ideal for a relaxing holiday away from the noise of the city center with all the necessary amenities and easy access to public transport. Note: -To access the second room it is necessary to go through the bathroom! Apartment clean and in a good location. As we are in the first floor it's noisy (subway, housecleaner in the morning), it's dark. As we stay for a short time it would be good to have the minimum to wash the dishes like a sponge and dish saop. - Habitat Apartments reply: Hello Beauvillier, thank you for taking the time to share your review with us. We are happy that you enjoyed the central location of our apartment and you could benefit from it. We really appreciated your suggestions, so we can do necessary measures to improve our services. It´s our hope that you give us another chance to better serve you in the future. Thank you! Es la primera vez que reservamos un Apartamento y la verdad es que quedamos sorprendidos , no dieron todos los amenities como en un hotel dos juegos de llaves la chica que nos recibio una crack ! En fin no dudariamos en recomendarlo . Estuvimos 3 noches en el ADN GROUND con 2 chavales que podian disfrutar de la terraza y en la zona hay de todo , la cocina y todas cosas nuevas (que no usamos porque haciamos todo fuera) en fin lo pasamos genial sin ninguna queja. The apartment ADN Ground is located in Sants area. Metro stop - 107 m.
Metro stop - 360 m.
Plaza de España - 0.42 km. Fira de Barcelona - 0.53 km. 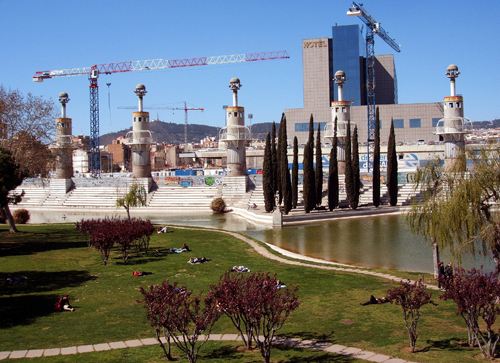 Foundation of Joan Miró - 1.67 km. Service was good. They checked us in on time However , there was no blanket at all. Just bed sheet. One of the pot light kept flashing And the toilet seat was half broken. Habitat comment: Dear Joe, thank you for your review, we will fix the mentioned problems. We hope you enjoyed your stay and we can welcome you back soon. Modern, mooi appartement met genoeg ruimte. Vlakbij supermarkt, bakker etc. Ook zeer dichtbij de metro. De auto geparkeerd in een parkeergarage dichtbij. Deze met flinke korting gezoch via internet..
Хорошие апартаменты в хорошем районе. В апартаментах на первом этаже слышно метро. Нет больших окон и балкона. Если вы планируете остановиться более чем на 1 ночь, выбирайте что-то повыше(собственно я изначально так и бронировала, но администрация попросила поменяться, а т.к. я останавливалась только на 1 ночь, то не было смысла им отказывать). В остальном очень хорошо оснащенные и комфортные апартаменты. Todo estaba bien cuidado y limpio.Muy céntrico y bien situado con respecto a la estación de Sants.Por un imprevisto, nos dieron el piso de entresuelo en vez de tercera planta. No teníamos vista y una habitación tenía un poco olor a tubería.Nos han regalado una caja de bombones por el imprevisto.Nos avisaron con anterioridad y esto se agradece. El piso estaba perfectamente equipado y es muy cómodo. Viajamos con niños y todo estaba adaptado a ellos también.La persona de contacto,puntual y amable Habitat comments: Estimada Lourdes, estamos satisfechos de leer que disfrute de su estancia en este apartamento. Lo sentimos por el cambio de apartamento sin vista y con un poco de mal olor, hemos arreglado el problema, muchas gracias por su comentario. Molto buono l'appartamento, comodo e servito per spostamenti nella città. Oyr stay in Habitat apartments was good. The spaces are nicely fornitured, clean and well kept. The equipment is fine (tv and cooking things) and the wi-fi is good. The only negative (of the groud floor) is the sound and vibrations of the tube and of the neighbours... One suggestion: Put a complimentary bottle of water in the fridge. Thanks, ciao, Ale. Habitat comments: Thank you for your kind feedback and suggestions. We would like to inform you that we provide extra amenities only at reequest basis for an extra charge. You can find all of the informations concerning our services in our webpage. Elegant and comfortable 2-bedroom apartment located near Plaza España in the traditional Sants district. Providing sleep up for 6 people and served by metro, train and buses.